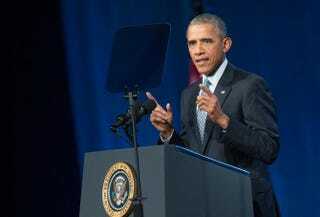 President Barack Obama addresses the International Chiefs of Police annual conference in Chicago Oct. 27, 2015. The event is the largest gathering of law-enforcement leaders in the world. President Barack Obama has been tackling criminal-justice reform with a vengeance, and on Monday the president plans to take his efforts a step further, announcing new initiatives to help former offenders successfully reintegrate into society. According to the White House, President Obama plans to announce actions that include access to education grants, an arrest guidance for public and assisted housing, job training, and other initiatives. The Department of Education is expected to award up to $8 million in federal grants over three years to former inmates. The Department of Housing and Urban Development will also be involved, and on Monday it released a guidance to public-housing authorities and owners of HUD-assisted housing, providing advice on how to use arrest records to determine eligibility for living in such properties. The Office of Personnel Management is also being directed to modify its rules where it can in order to delay probes into criminal background until later in the hiring process. In a press release, the White House added that the administration was "encouraged" that Congress is considering bipartisan legislation to "ban the box" in federal hiring and hiring by federal contractors. "Each year, more than 600,000 individuals are released from state and federal prisons. Advancing policies and programs that enable these men and women to put their lives back on track and earn their second chance promotes not only justice and fairness, but also public safety," the White House noted in the handout. "These announcements mark a continuation of the Obama administration's commitment to mitigating unnecessary collateral impacts of incarceration." In his weekly address, the president previewed his trip to Newark, N.J., to announce the initiatives while speaking of the steps he's taken over the past year—including a July visit to a federal prison—to highlight the issue. "We know that having millions of people in the criminal-justice system, without any ability to find a job after release is unsustainable," he said during the address. "It's bad for communities, and it's bad for our economy."